Few things are cuter than baby animals, which is why a lot of mommies-to-be choose fun animal themes for their showers. Whether you’re thinking Noah’s Ark or a zoo theme, there are some super cute animal themed baby shower favors to choose from! If you’re on a tight budget or simply want to keep costs down, you don’t have to worry about sacrificing quality. There is a wide range of animal themed baby shower favors that you can get for under $1.00. 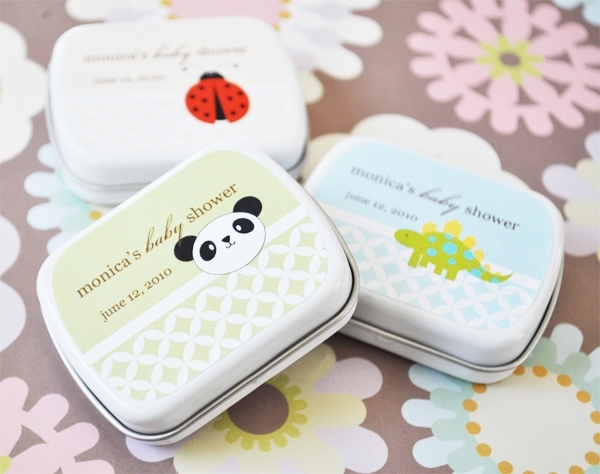 These Baby Animals Personalized Mint Tins are a perfect shower favor. They’re super cute, and your guests can use them long after the shower is over. Because they’re personalized, they serve as the perfect memento of your celebration. Noah’s Ark is one of the most popular baby shower themes, so a lot of great mommies-to-be think alike. The trick is to find a great Noah’s Ark favor that your guests will adore, and will be able to use for a long time. 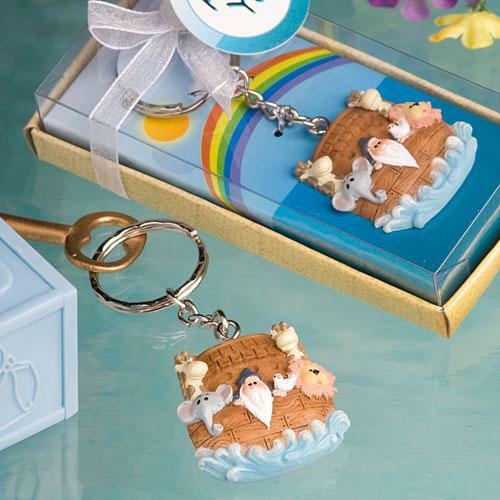 The perfect solution is the Noah and Friends Collection Key Chain Favor, which features a poly resin Noah and some of his friends in the famous ark. It’s packaged in a clear box with a backdrop of the ocean and a beautiful rainbow. This favor is fun and affordable! Sometimes, moms can feel like they’re running a zoo! It’s a labor of love certainly, and with the upcoming arrival of a little bundle of joy, what better way to celebrate than with zoo or jungle themed baby shower favors? 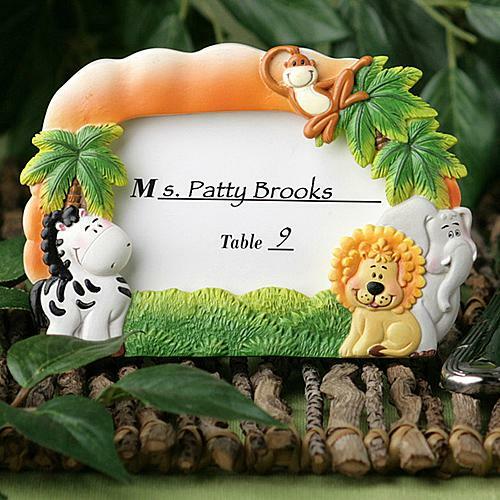 The Jungle Critters Collection Picture Frame can be used to hold place cards for your baby shower, and then later used to hold pictures your guests love. A wonderful memento, this frame features a playful baby elephant, zebra, monkey and lion and is created from hand-painted poly resin. Each of these favors are perfect for a girl or boy baby shower, and will delight your guests! This entry was posted in Animal Baby Favors, Baby Favor Tins, Place Card Holders and tagged key chain, noah's ark. Bookmark the permalink.